Night Herons in Amsterdam | Why watch wildlife? It’s become common in zoos in the UK to see wild animals adapt to readily available food sources. In Amsterdam another species adds to the list. In a UK zoo you’ll generally see Robins and House Sparrows. Probably Blackbirds. Usually corvids such as Crow, Magpie and Jackdaw. And, if there are fish eaters like penguins and pelicans, then Grey Heron are likely to establish a colony too. At the Royal Zoo in Amsterdam, Europe’s oldest zoo, all these are present. But there was also a bird I’d never seen before, and at first assumed it was part of the collection. This is actually a Night Heron, and the fact I took this from my phone tells you how tame they are. They’d formed a roost in the trees by the pelican/gibbon enclosure. There were probably 20 individuals, and it soon became clear they were free-flying ‘wild’ birds that have just settled there, apparently one of just three colonies in the country. There was plenty of aggression between them, Grey Herons, Cormorants, and the actual occupants of the enclosure. But they are obviously all thriving. 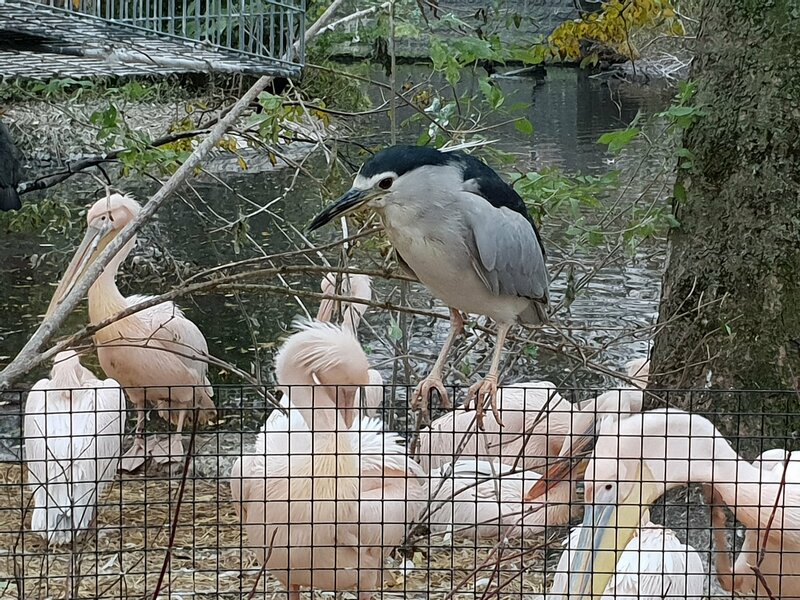 This entry was posted in Birds and tagged amsterdam, colony, feral, netherlands, night heron, wild, zoo. Bookmark the permalink.